After practicing yoga for 18+ years, having two children, healing injuries and growing just a little older in that time, my personal yoga practice has seen just about everything and every style. In the past two decades by biggest lesson was to meet each style, each class every moment with an open mind, to stay present and to welcome grace. Yet when we opened our second yoga studio in Brunswick, ME and the words Aerial Yoga were uttered..I froze. Was I joining the circus, was I going to fall from the ceiling, is this safe? I was clueless, but intrigued. I felt like a beginner, starting all over. So where do we begin? It begins with intention, the mindset, that precedes every action, and set my intention on “letting go of fear”. 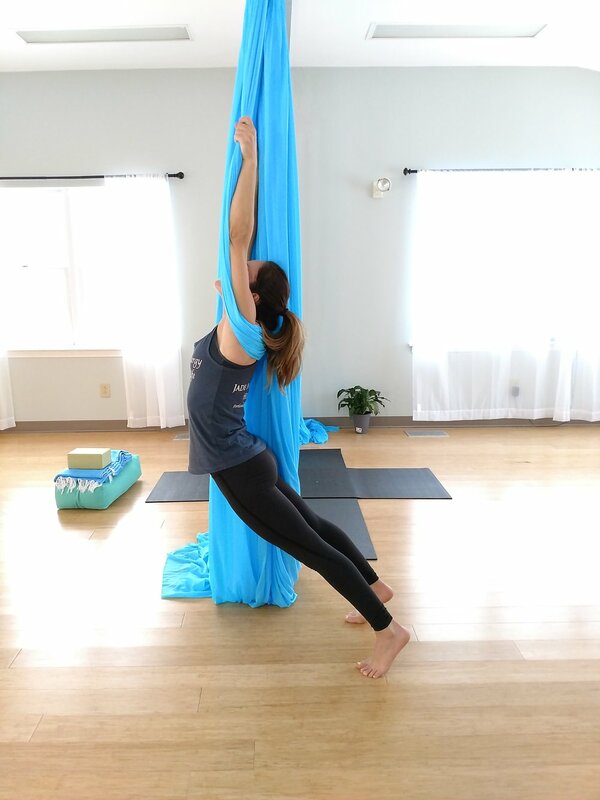 I trained, studied, flipped and struggled and in a stalled moment of apprehension, I went back to my intention, and there it was, I was upside down, wrapped in silks…freedom. For me, aerial yoga is like normal yoga... times 10. Not in terms of difficulty, but in terms of how effective, fulfilling and calming it is. You sit in a fabric hammock that looks kind of like a long scarf. Our hammocks are made out of special, high-density nylon material that can support over 500 pounds and are held up by carabineers clipped into a track system that can hold the weight of a vehicle. I experimented with traditional yoga poses and aerial adaptations of traditional poses using the hammock for support. Some of the most basic poses involve simple stretches while seated on the hammock, while other poses progress to hanging upside down and grabbing your thighs, ankles or feet for support and balance. My personal favorite is savasana (final relaxation) in the hammock. In my classes and personal yoga practice I enjoy considering how yoga teachings, the yamas & niyamas, as well as the sutras are absorbed in body, heart and mind. Aerial yoga is no exception as it literally takes us to new levels, asking us to address our fears and thoughts that might be holding us back from trying something new (for most of us). After all “on the other side of fear, is freedom”.